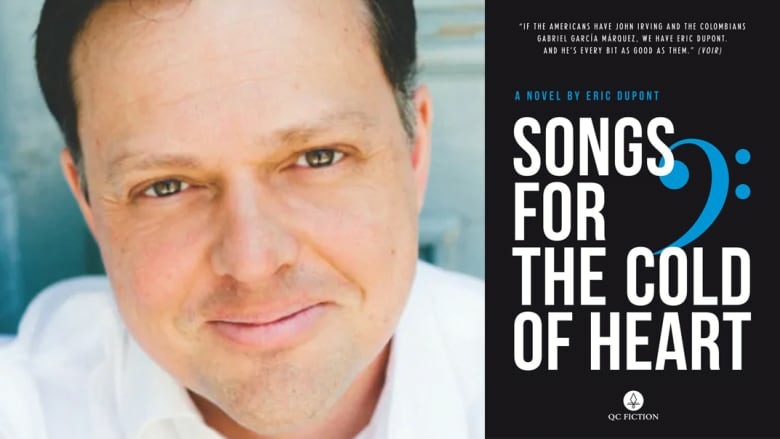 The Montreal author's novel Songs for the Cold of Heart is up for the richest prize in Canadian literature. Montreal author Eric Dupont is one of five authors — the others being Esi Edugyan, Patrick deWitt, Thea Lim and Sheila Heti — up for the $100,000 Scotiabank Giller Prize in 2018. The Montreal author of Songs for the Cold of Heart gathered with his fellow finalists recently on stage at Calgary's Wordfest for a special Scotiabank Giller Prize panel, hosted by The Next Chapter's Shelagh Rogers. "To learn I was on the shortlist was, in a word, thrilling. I'm still stunned. I initially found out about it by a phone call from my translator Peter McCambridge. I was sleeping at the time, so I was wondering why he was calling me so early and why he was talking so fast given that he's a very soft-spoken person. And in the salad of words that he was belching out, I heard the word Giller — and that's how I found out!" "I wrote Songs for the Cold of Heart because I come from a family of storytellers and I don't have my own children to tell stories to. When I was writing the book I was thinking a lot about my nieces and nephews. I have a story to tell and the need to play the role of the storyteller." Who will win the $100,000 Scotiabank Giller Prize?